(Newser) – As Beethoven went deaf, he may have started listening to his heart. In a new study published in Perspectives in Biology and Medicine, a cardiologist, an internal medical specialist, and a musicologist point out that three of the German composer's works exhibit "rhythmic shifts and punctuations" that weren't typical of music during his time but that closely resemble various forms of heart arrhythmia. Although the Los Angeles Times notes that Beethoven's heart was found "structurally sound" in an autopsy, no one knows for sure what medical conditions he suffered from. 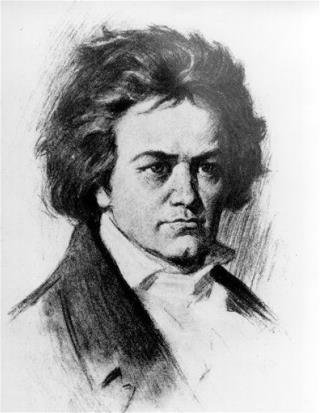 The study analyzed Beethoven's Piano Sonata in E flat major, the String Quartet No. 13 in B flat major, and the Piano Sonata No. 12 in A flat major. So we all should be Grateful to this MAN!! Cause his HEART was in all his MUSIC!! His MUSIC over 300 year later!!! Still Beautiful MUSIC for my EARS and my SOUL!! YOU GO LUDWIG!! There ya go ALL!! One word: "Appassionata". Go listen to the first mvt. of that sonata and you will hear EXACTLY what this article is about.